Inventory management is all about inventory and controlling its related costs. Your job is to figure out just how much material you have on hand and the right time to bring in more. But your inventory is most likely stored in a large, dark, and often dusty vessel. Short of x-ray vision, youhave no way to safely “see” what is actually in them. Fortunately, there are many devices available to help you accurately measure your inventory. One category of inventory monitoring technology is called point level. Point level indicators are an affordable stand-alone tool that acts as alert when inventory has reached a high or low level or as a level alarm when used as part of an inventory management system. Easy to set up and configurable to fit yourapplication’s needs, point level indicators are a must have for a safe, efficient operation. Let’s explore some point level sensor options and considerations when selecting a device. Rotaries are a familiar and common device used for high or low-level point level indication in bins, tanks, and silos. Rotaries are versatile enough to use in nearly any material from powders and granules with a minimum bulk density of 2 lb/ft3 (approx. 32 kg/m3) to coarse, lump materials with bulk densities up to 150 lb/ft3 (approx. 2400 kg/m3). The principle of operation for rotaries is quite simple. When the rotary is used to alert that material has reached a high level while the tank is filling, the paddle rotates continually until material reaches the paddle. When the paddle meets resistance due to the presence of material, it stops rotating and sends an alert via a control room, horn, light, or an alarm panel. Conversely, as a low-level indicator, the paddle will begin turning when material drops below the level of the paddle and will send an alert or can be wired to shut off a process system. There are different types of rotaries that warrant consideration depending on how critical the role of the rotary is in the operation. Most standard rotaries are designed to provide protection from system power failure. Some feature a motor that “goes to sleep” or “de-energizes” to automatically shut down when material is present, which also serves to extend motor life. If the rotary is critical in starting, stopping, or controlling a process, or causing a work stoppage if a tank should become empty, the application calls for a fail-safe rotary. These rotaries continually self-diagnose, and in the event of a failure, send an immediate warning and instantaneous corrective response. Fail-safe models often have an LED light or other visual indicator on the unit for visual monitoring of the motor status. Rotaries are increasingly applied in new and innovative ways. For high level detection at the interior of a vessel, a vertical extension on a rotary can allow it to be extended as far as 12 ft (approx. 3.65 m) down into the bin, tank, or silo. This configuration is recommended for a center-fill vessel when the operation requires a specific amount of headroom. Mounted on the top of the vessel, a vertically-extended rotary can alert when material is higher toward the center of the container, versus simply detecting the level of material near the sidewall which could be at a lower level when filling (cone up) and at a higher level when emptying (cone down). For thick tank walls, such as those in cement silos, a horizontal extension allows for a rotary to be used to detect material levels through the sidewall. When a horizontal extension is combined with a collapsible paddle, the rotary can be installed through a 1-1/4″ or 1-1/2″ NPT opening without entering the vessel. Flexibility is a key attribute of point level sensors. While commonly used for high level indication, they can trigger an alarm anywhere along the vessel wall—alerting to low levels for timely refills and adjusting for variances in seasonal high-level inventory fluctuations. Capacitance sensors are designed for a wide array of applications and can easily be customized with different type of probes, lengths or extensions. These sensors may be used for high, mid and low- level detection in bins, silos, tanks, hoppers, chutes, and other types of vessels where materials are stored, processed, or flowing. Capacitance sensors operate by detecting the presence or absence of material in contact with the probe by sensing minute changes (as low as 0.5 picofarad) in capacitance caused by the difference in the dielectric constant of the material versus the air. When selecting a capacitance probe, understanding the radio frequency range of the device is an important consideration. According to the Federal Communications Commission, signals in excess of 9 KHz are classified as “RF” and are prone to radiate device which may have an impact on other equipment in the plant. For food, feed, pharmaceutical, or chemical processing applications where the risk of contamination must be minimized, a shielded, Delrin- sleeved sanitary probe is often appropriate and will meet the regulatory requirements for the material application. A sanitary probe must be tested and proven to meet USDA or 3-A Sanitary Standards for hygienic equipment design to ensure the purity of material being measured is not compromised. A sanitary probe should be designed for quick disconnect from the device, so it may easily be removed from the tank for inspection and cleaning. Sanitary versions of capacitance probes are also designed so there are no exposed threads where material can build up and become contaminated. To guard against false readings from buildup on the probe or bridging between the sidewall and the probe, a portion of the probe should be shielded. The shielded portion of the probe emits a non-sensing signal that forces the active signal to examine a large area around the probe. This enables a capacitance probe to be used in vessels used to store a wide variety of dusty, sticky, or clinging materials without the risk of false alarms. A time delay feature can minimize false alarms in the case there is a sudden material shift caused by rapid filling or emptying of tanks or process activities. A time delay operates by “waiting” a set period of time prior to acknowledging the signal for a change in the presence or absence of material. A time delay can be set separately for “uncovered to covered” or “covered to uncovered” conditions and may be adjusted for a delay of up to 30 seconds. If continuous process operation is critical, look for a capacitance sensor that features fail-safe protection to eliminate process shut-downs, overfills, empty conditions, or accidents. To prevent overfills or material shortages, a high/low selectable switch allows the sensor to be set for fail-safe high or fail-safe low. An extended, flexible cable extension can be attached to the capacitance probe in instances when the sensor is mounted on top of the tank and will be used for high, mid or low-level detection. The extension can be customized to the desired length dependent on how far into the tank the material must be detected. A flexible extension is immune to the type of damage that may occur with a rigid probe. A flush mounted probe can be used in narrow or space-constrained areas or in applications where material flow or bridging may damage a standard probe. This type of probe mounts flush on the wall of the tank, on a conveyor housing, or in a chute. When mounted in tanks with thick walls or angled hoppers, a wall adapter is used to mount the probe flush or slightly protruding the inside of the vessel wall, which will help eliminate false signals due to excessive buildup on the probe surface. When the vessel is small or has internal obstructions, a bendable probe can be used to avoid obstructions, while still allowing adequate probe surface area to detect the presence or absence of material. A bendable probe can be used in places where other sensors won’t fit, including smaller mixing tanks or storage vessels used in material processing applications. If your facility has an explosion proof requirement, you will need a capacitance sensor designed and certified for hazardous location applications. This CSA certification ensures the sensor housing is tested and proven to provide explosion proof protection in volatile process environments. If the application is in a high temperature environment or in an area where there is excessive vibration, it is appropriate to install a capacitance probe that houses the electronics and probe in separate enclosures. This remote configuration allows the sensor’s electronics to be safely mounted in a location away from the sensing probe, which will protect the electronics from the source of heat or vibration. Extremely durable “heavy duty” probes are available specifically for high bulk density materials such as coal or aggregates as well use in challenging high temperature applications such as fly ash or clinker. The vibrating level sensor or vibrating rod is a piezoelectric driven vibration type level switch that can be used for level detection in bins, silos, and hoppers filled with dry bulk solid materials. A vibrating level sensor can detect extremely light, fluffy materials as light as 1.25 lb/ft3 (approx. 20 kg/m3), such as powders and flakes or can be used for heavy materials such as granulars or pellets. These are rugged sensors that are often constructed of durable stainless steel and are virtually wear and maintenance free. 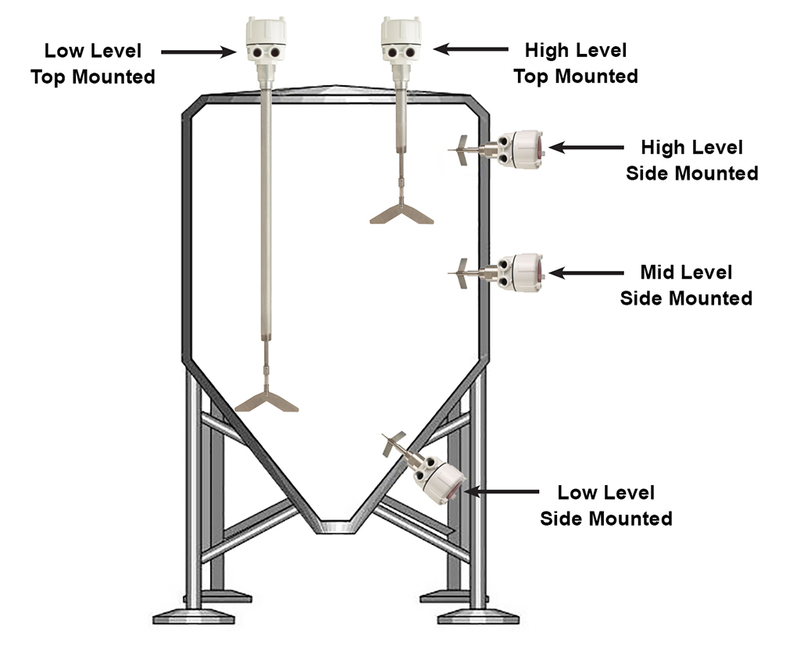 A vibrating level sensor can be utilized as a high, mid, or low-level alert and can be mounted on the top of a tank as a high-level detector or in the bottom cone to sense when a vessel is nearly empty. Vibrating rod level sensors vibrate when there is no material covering the active rod. When the rod is covered with material, the vibration is dampened and an electronic circuit causes a relay to switch and sends an alert. When the rod becomes uncovered, the vibration restarts and the relay will switch back. Unlike a tuning fork that has two probes where material can become lodged and give a false signal, a vibrating rod features a single probe design that prevents material from bridging and giving a false signal. Vibrating level sensors are known for high performance and reliability and since the sensitivity is located at the tip of the sensor, material built up on the vessel wall will not influence the function of a vibrating level sensor. Plus, the combination of low energy and tip sensitivity reduces false alarms due to rat-holing around an active sensor. As the vibrating level sensor is piezoelectric, it can be used to overcome difficulties in some applications that may be associated with changes in dielectric constant, humidity, temperature, or material density. With advancements in product design, most vibrating rods do not require calibration and easily adjust to the desired sensitivity level. For process-critical applications, be sure to look for features such as a fail- safe alert that provide notification when power is interrupted to the unit to avoid overfills and empty tank situations that could shut down operations. Other available features may include models for high temperatures or with remote electronics. Depending on the manufacturer, some vibrating rods can be extended into the vessel if the vibrating sensor is to be used in a top-mounted application for high level detection. Maintenance and plant management use point level sensors as an important component in controlling the production process. Used as high, low, or mid-level sensor, they can assure a continuous supply of material into a production process and prevent downtime. When used in conjunction with an alarm, such as a horn or light, they eliminate the need to climb vessels to monitor fullness, making the workplace safer and reducing the need for climbing. These mechanical devices are easy to install through an existing mounting connection. Many offer varied power supplies, making them convenient to wire to the existing electrical system. An often-overlooked advantage is that point level sensors play an important role in redundancy in an inventory management system. Used as a fail-safe high level indicator, point level sensors can alert to potential overfills. Working in tandem with continuous contact or non-contact sensors, these highly reliable devices may detect a potential issue that could cause material waste or damage to the structure, expensive equipment, or other sensors in the vessel. A tilt switch is an affordable, reliable high-level indicator that is easy to install and requires no routine maintenance. A hanging tilt switch is installed by suspending it from a flexible cable over a control point. Its principle of operation is quite simple–as material rises below the switch, it will tilt and activate a microswitch when the tilt reaches 15 degrees. Tilt switches are routinely used in bins or silos or over a conveyor belt or open pit. A hanging tilt switch can also be used for plugged chute detection. When it comes to point level controls there is a robust selection of technologies at affordable prices starting at a few hundred dollars up to about a thousand dollars. Point level measurement is one critical piece in the level measurement puzzle that, when assembled correctly, will give you a clear picture of your inventory. Jenny Christensen, MBA is the vice president of marketing for Garner Industries, home and manufacturer of BinMaster Level Controls. BinMaster is an ISO 9001:2015 certified US manufacturer of point and continuous level indicators and inventory management systems used for monitoring the level of bulk solids or liquids in bins, tanks, silos, and hoppers.